How many times have you heard yourself saying "It's on the tip of my tongue... but I just can't get the word"? Well, here's a new kind of reference book that puts your ideas into words quickly and easily. 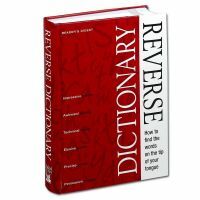 It's the REVERSE DICTIONARY and it starts with an idea, a description, a similar word and follows through to the exact word you need. Plus illustrations, the word's precise meaning, spelling, pronunciation... everything you need to fix it in your mind. This book is a wordfinder par excellence!